This "true color" Chandra image of N132D shows the beautiful, complex remnant of an explosion of a massive star in the Large Magellanic Cloud, a nearby galaxy about 160,000 light years from Earth. The colors represent different ranges of X-rays, with red, green, and blue representing, low, medium, and higher X-ray energies respectively. 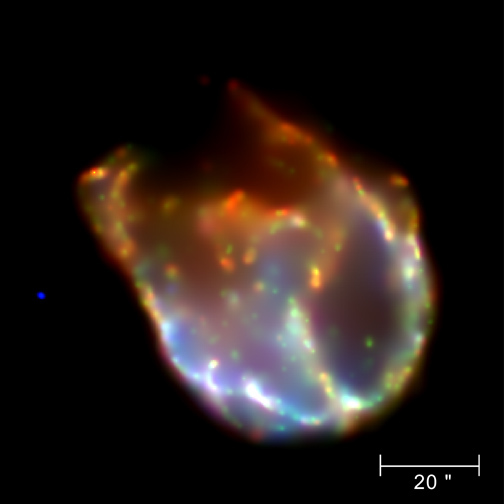 Supernova remnants comprise debris of a stellar explosion and any matter in the vicinity that is affected by the expanding debris. In the case of N132D, the horseshoe shape of the remnant is thought to be due to shock waves from the collision of the supernova ejecta with cool giant gas clouds. As the shock waves move through the gas they heat it to millions of degrees, producing the glowing X-ray shell. Scale Image is 100 arcsec on a side. Coordinates (J2000) RA 5h 25m 2s | Dec -69deg; 38' 59"
Color Code The colors represent different ranges of X-rays, with red, green, and blue representing, low, medium, and higher X-ray energies respectively.